…and it’s fun, even if it’s not an ideal day for foiling. The central hull weighs around 25kg plus outriggers at 12.5kg each. The Flying Mantis is designed to be rigged quickly. The outriggers can be fitted or derigged without taking down the mast. 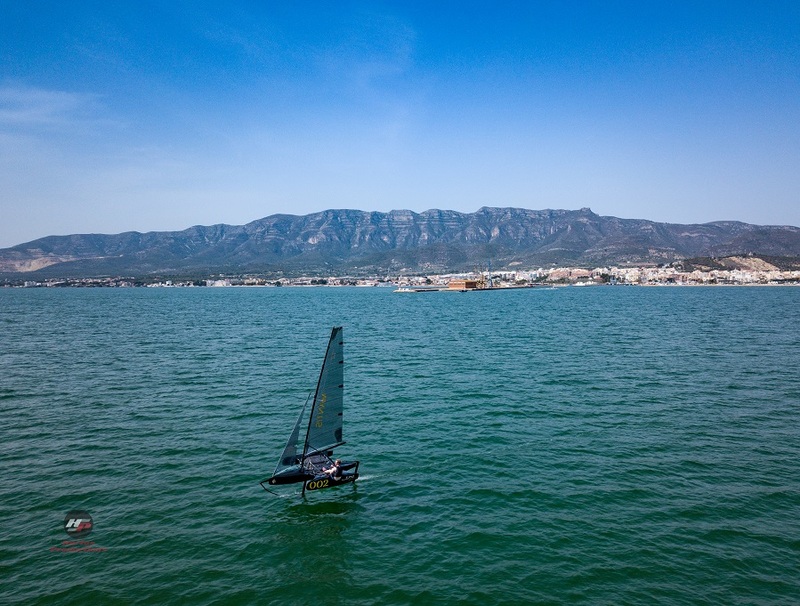 It doesn’t need to live in a dinghy park, which makes it easier to sail somewhere different each day. A great boat that any sailor can enjoy. It comes with a lift-up rudder and a central daggerboard. 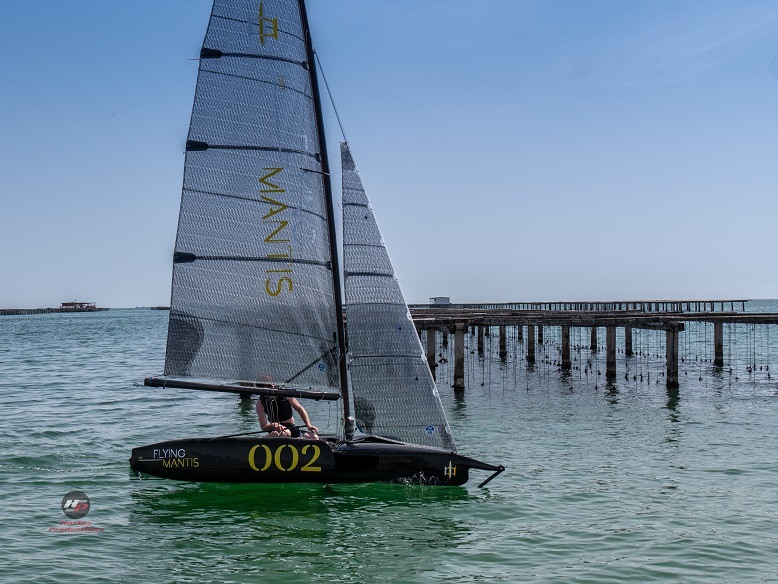 This boat has all the advantages of lightweight carbon hulls, mast and boom that result in high performance and forgiving multihull sailing. Everything from the daggerboard sailing (DBS) version plus additional central and rudder T-foils, a conversion insert for the daggerboard case and a foiling system to connect a control wand to the front of the bowsprit. 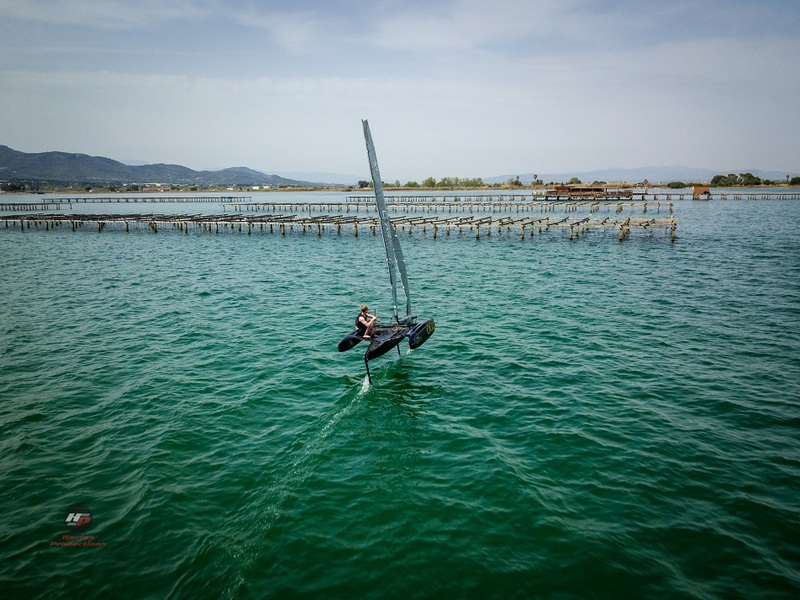 Designed to provide early take-off at lower boat speeds enabling more fun in lighter winds. The 3 hulls are quick and easy to assemble, and are extremely light so less power is needed to drive the Flying Mantis forward. A relatively flat underside minimises time in the water, generating hydrodynamic lift. 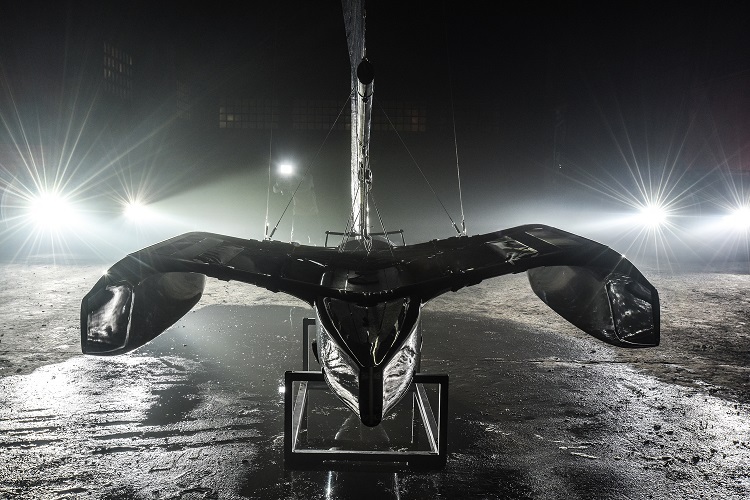 The U-shaped hull maximises displacement as the boat drops off the foils. 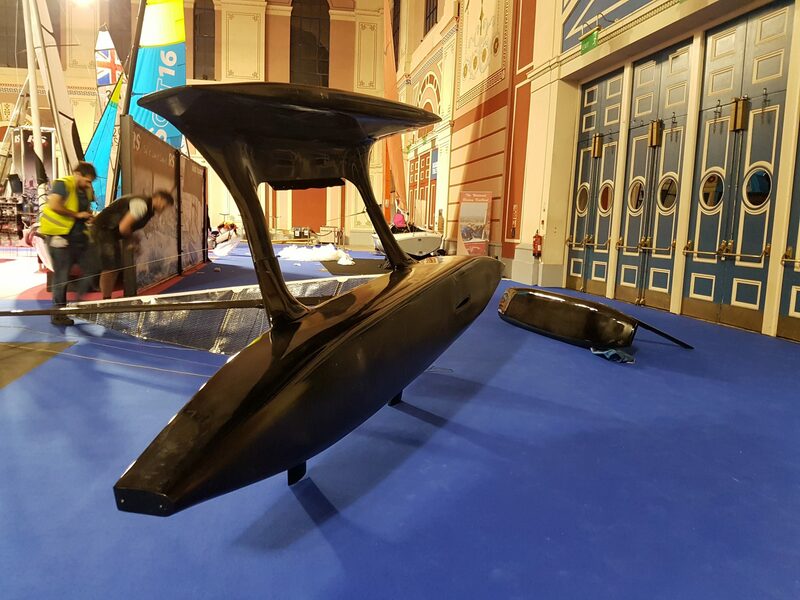 The hulls are an epoxy sandwich carbon construction with a painted and lacquered finish that weighs less than the usual gel coat. Hull colour is customisable. 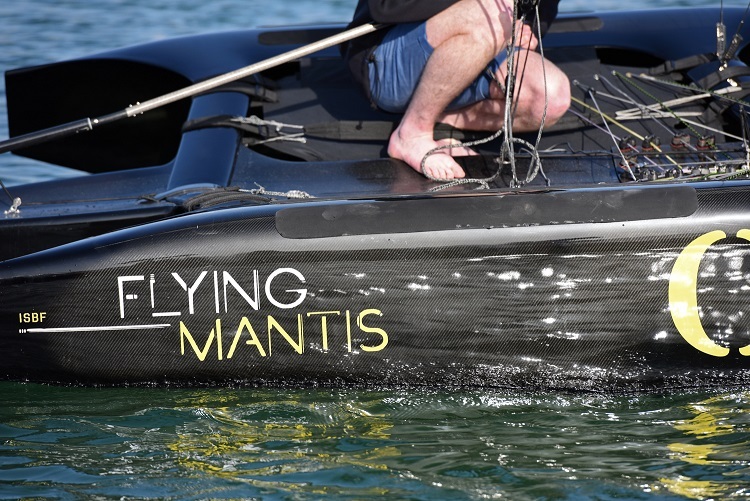 The high performance, lightweight construction of the Flying Mantis means that this boat should not be run up onto or dragged along a beach. The central and rudder T-foils can be lifted to help launch/recover from a beach. The control wand is attached to the end of a bowsprit, well forward of the central foil and close to the water. Being forward enables control of the pitch and ride height, and eliminates flow distortion from the central foil. 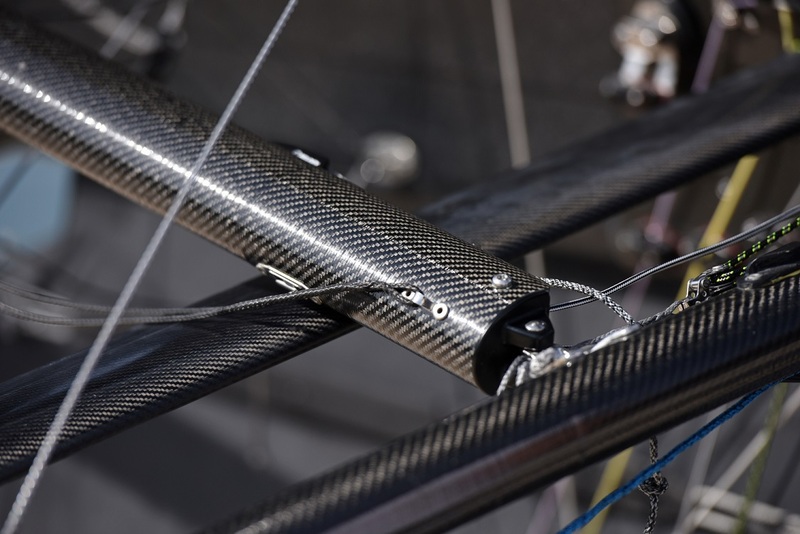 The twist-grip tiller controls the angle of the rudder T-foil, giving positive lift upwind and negative lift downwind, (less chance of pitch-poling). Designed in conjunction with North Sails. The addition of a jib to the main helps to keep the centre of effort low and balanced. Read this. No, really read this. “The challenge of sailing is knowing your limitations and being able to judge when you are exceeding them” Martin Kenny, Tynemouth lifeboat. Follow the guidance on safe sailing and make sure you are prepared. Do not go sailing if no-one knows where you are and you have no means of rescue. 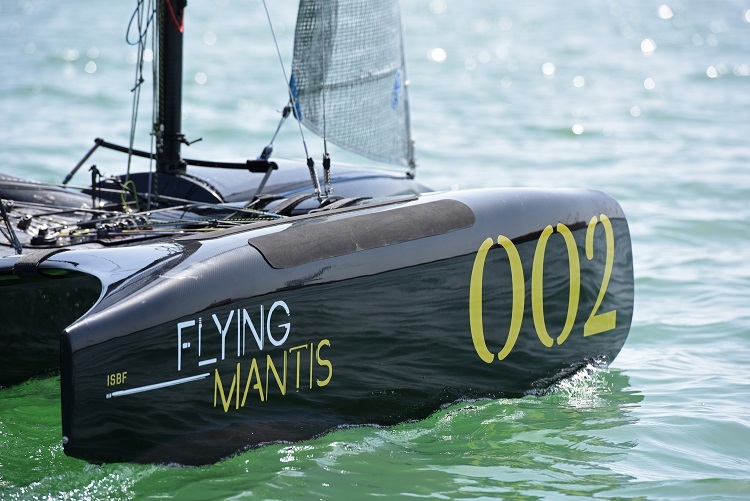 The Flying Mantis is a performance craft. Wear protective clothing. Have fun.